Sheriff Kevin Wells has been a member of the St. Lawrence County Sheriff’s Office since 1984. He has held the rank of Deputy Sheriff Patrol Officer and Sergeant and has worked within the Criminal Division (DARE Officer) and in 1999 was selected as Undersheriff by Sheriff Gary Jarvis. Upon Sheriff Jarvis’ retirement (2007), Kevin Wells was elected by the people of St. Lawrence County to be their Sheriff. 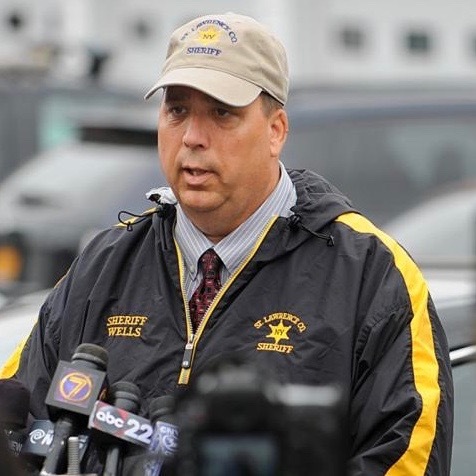 Sheriff Wells hold an Associate Degree from SUNY Canton (1981) and a Bachelor’s Degree from SUNY Utica-Rome (1983) both in Criminal Justice. The Sheriff is a certified Police Instructor and evaluator and has received hundreds of hours of training and specialized certifications throughout his career. St. Lawrence County completed construction of a new 164 bed County Correctional Facility in 2009. The Sheriff’s Office is a fully operational Sheriff’s Office with a Criminal Division that include a countywide Drug Task Force actively working in this International border county. The Sheriff’s Office holds accreditation status in both their Civil and Criminal Divisions with the opening of the new Correctional facility will be striving to meet all criteria for full accreditation status. Sheriff Wells has two children and three grandchildren. He and his companion Mary B. Curran reside in Canton.